Happy Thursday! February has been so cold in STL. We have not gotten a lot of snow, but the temperature has been below freezing for almost the entire month! Elle and I are ready for spring, which is why our spotlight weekly theme is THINK SPRING! Come share your early spring looks with Elle and I! 1. 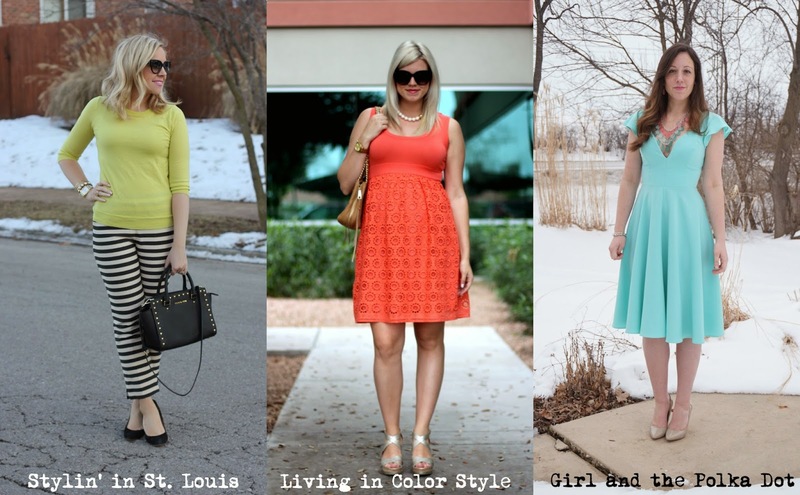 We kindly ask that you follow the two hosts: Elle from Living in Color Style and Jacqueline from Stylin' In St. Louis via Bloglovin or GFC and of course our co-host Mel of Girl and the Polka Dot . Spotlight: Our spotlight this week is Lauren of Lauren McBride Blog! Lauren's winter white look is so well put together! We just love all the neutrals she added to make this look come together! Be sure to check out her cute blog! Next Week: Next week our spotlight weekly theme is POLKA DOTS! Thanks for linking up! See you next week! Loooove these pants. so cute. Love the striped pants & they look great with the bright top! Bring on spring, I totally agree! Love those striped trousers on you, babe! Your striped pants are so cute! I love them paired with the bright sweater! You are making me so ready for spring. Love the pants! I love those stripe pants - they are so fun paired with the yellow. The striped pants take this outfit from drab to fab! I love it. Your striped pants are adorable and perfect for spring, love it!! Stay warm!! Those pants are soooo good! Loving this color!! I am so ready for Spring fashion, but unfortunately they are calling for snow here pretty much Saturday-Wednesday! Hopefully it will be the last of it ahah! Love those striped pants! And the pop of color with the sweater is perfect! Loving that pop of color! It looks so beautiful with your striped pants! I'm ready for Spring too, girl. This winter has been brutal! Love that pretty, bright sweater and those striped pants are all sorts of amazing! Those pants are the cutest! And I love them with that sweater. Now, bring on the spring weather! This look is super chic! I love the stripe pants with the pop of yellow! Cute I love those striped pants how fun! Great look! Love the outfit! Those striped pants look great! And the bag is gorgeous! Love those striped pants with that almost neon colored sweater!! Gotta love spring! I love these colors. They all look beautiful. The first one is my fave.